Spring is grapefruit season here in Tucson and my neighbors are always generous with their harvest. Sometimes a little too generous* and I have to find ways to use all the beautiful citrus I'm gifted with. My answer is usually to head over to the bar, grab the juicer and serve those free grapefruit right back to my neighbors at happy hour. When I only have one or two grapefruit I'll serve up my Pink Grapefruit Martini, but when I'm blessed with a multitude of grapefruit to take advantage of then a party and a tall drink is called for. A classic Paloma, a Greyhound or a Salty Dog are all good solutions to using up grapefruit gifted by the dozen. The Paloma is made with tequila, the Greyhound was originally made with gin and I was in more of a vodka mood so I went with an adaptation of both the Greyhound and Salty Dog. As a nod to spring I added a little floral twist to the classic recipes. Whenever you have fresh grapefruit, you need to make this cocktail. It's comparatively light in alcohol, healthy and very refreshing when temperatures and thirsts are high. DIRECTIONS Peel the entire skin of one grapefruit and set aside. Cut 2 grapefruit in half. Slice off one wedge and set aside. Juice the remainder of the grapefruit. 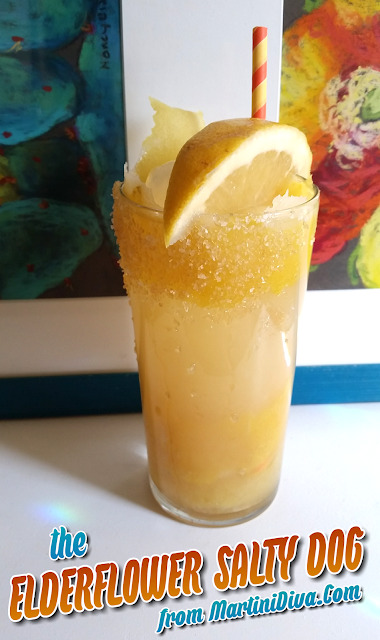 Rim your glass with grapefruit juice then dip in the salt and sugar, press the grapefruit twist against the inside of the glass, fill glass with ice then chill the glass in freezer. ** Blend one ounce of warmed grapefruit juice with two tablespoons of Honey Ridge Farms Lemon Créme Honey and add this to the cocktail shaker. Fill shaker with ice then add the vodka, elderflower liqueur and fresh grapefruit juice. 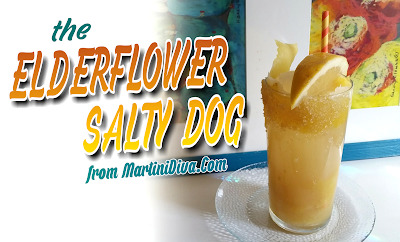 Shake until chilled, strain into the glass, garnish with the grapefruit wedge, add a straw and serve. * I usually tell people I don't like grapefruit, but the truth is grapefruit doesn't like me. I actually love fresh grapefruit, but it can be very hard on my stomach unless it's very sweet and even then I always add a pinch of salt and extra sweeteners to ease the tartness. Canned grapefruit is always too acidic and never passes my doorstep so don't ever drop in at happy hour for a Salty Dog or Greyhound*** when grapefruit aren't in season. *** What's the difference between a Salty Dog and a Greyhound? The Greyhound, originally a gin cocktail, not vodka, is simply either of those spirits mixed with grapefruit juice. The Salty Dog just adds a salt rim.